Hyundai sales boss Dave Zuchowski “can sell ice to the Eskimos,” says one impressed dealer. LOS ANGELES -- Way back in 1999, executives at struggling Hyundai Motor America dreamed of bringing the Equus luxury sedan to the United States. "We had an Equus demo," says Finbarr O'Neill, who took over the reins of the U.S. company that year. "It was fun to drive to soccer games. People would say, 'What is that?' But we knew we couldn't do it at that time. "Hyundai had a bad reputation in the '90s. There was a lot of snickering about us, and we had to fix that." 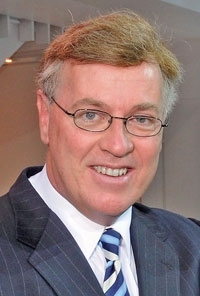 O'Neill, now president of J.D. Power and Associates, says internal measures showed Hyundai's quality was improving even then. "But it takes a long time to establish a brand," he adds. "Now they've earned credibility in the marketplace with value, quality and styling, and I see Hyundai being even more competitive in the coming years." Is Hyundai now a bona fide Tier 1 brand? Or has it merely benefited from being a value brand in a weak economy -- to be kicked to the curb when consumer confidence returns? 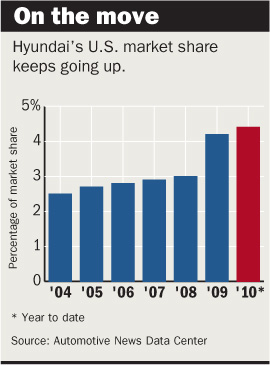 Evidence persists that, despite its market share surge in the recession, Hyundai still has work to do to shed its past reputation of selling cheaply built cars. Dave Zuchowski, Hyundai's top U.S. sales executive, admits that the brand needs to improve key factors such as residuals and dealership quality. He says Hyundai is moving aggressively to upgrade them, just as it did with vehicle quality. The redesigned 2011 Sonata is off to a strong start. -- Sales and market share are on the rise, while huge competitors such as Toyota and Honda have seen their shares decline. -- New and redesigned models such as the Genesis, Sonata and Tucson are enhancing the brand's image, and the Equus is coming to market this fall. -- Purchase intent, consideration and residual values are climbing. The captive finance company is stronger, and dealers are making more money. -- Toyota is back in the hunt with heavy incentives, Ford is strong, and Chevrolet is improving. -- Luxury sales are rebounding, showing that some consumers are returning to traditional upscale marques. -- Management stability -- a chronic weak point for Hyundai -- remains a question. Hyundai's acclaimed top marketer, Joel Ewanick, moved to Nissan in March and has since moved to General Motors Co. Mike Buckingham, head of the captive finance company, stepped down April 30. -- Most important, almost every study concludes that consumers still don't love Hyundai. "Our No. 1 avoidance issue is resale value," Zuchowski says. "But we're addressing that with better quality, a reduction of fleets, and our incentive spending is down 38 percent. "Our resale values are rising quickly, but until people can see that our value is equal to or better than the competition -- until they can see that -- that's our No. 1 obstacle." Zuchowski says he clearly laid out the brand's goals at the annual dealer meeting in April. He says he told dealers they need to raise their game. "Our No. 1 goal this year is our dealerships," Zuchowski says. "The product is good, but the sales satisfaction experience is low." Hyundai doesn't expect lavish stores, but showrooms need to improve, he says. "We don't want them to build Taj Mahals," Zuchowski says. "Don't spend stupid money, but be damned sure your appearance is appealing." Hyundai's product is taking off. Hyundai's average transaction price of $23,468 is higher than it has ever been. And its average incentive of $2,287 is lower than the industry average of $2,775, according to Edmunds. But Hyundai still falls far short of elite status. The Edmunds data show Hyundai's flagship luxury Genesis model is mostly cross-shopped against other Hyundai vehicles, such as the Genesis Coupe and Azera sedan. The Genesis' best showing among luxury browsers was the 10 percent of shoppers looking at the Lexus ES 350 who also cross-shopped the Genesis. Shoppers looking at brands such as BMW, Mercedes-Benz, Audi and Cadillac hardly considered the Genesis. Luxury shoppers' attitudes carry through to mainstream car buyers, another study shows. The consumer research company BrandIndex in New York reports that Hyundai's overall brand perception improved to 15 on April 27 from minus 2 on Jan. 1. But when it came to two components of the overall score -- quality and willingness to recommend -- Hyundai's score was 5. That's well below the 62 for Honda and 60 for Ford and about on par with Toyota, which is suffering from recall problems. BrandIndex rates brands on a scale from minus 100 to 100. Zero means equal positive and negative perceptions. Generally the highest score is around 60. A March study by Consumer Research International, a research company in Findlay, Ohio, found that Hyundai has a growing group of loyal current owners who say they trust the brand and think it is reliable. Such loyalists can translate into positive word of mouth. But although those numbers are rising, other consumers still don't trust Hyundai. "They're building a very loyal group of customers," says Mae Nutley, director of analytics at Consumer Research. "But there is a serious issue in gaining new customers. The overall brand image still is not that high." Hyundai says it is targeting design and resale value. Residuals are up about 7 to 8 percentage points on the redesigned Sonata and 9 percentage points on the redesigned Tucson crossover. Eric Ibara, director of residual-value consulting at Kelley Blue Book, says the Tucson's residual rose from 21.5 percent on the 2009 model to 30.5 percent on the 2010. Residuals measure what a vehicle is expected to be worth, expressed as a percentage of sticker price, after three years. That's below the segment average of 32.5 percent "but still significant over where it was," Ibara says. He says the 2011 Sonata's residual is at 35 percent, compared with about 27 percent on the 2010 model. The industry average for the 2010 mid-sized car segment is 28.2 percent, Ibara says. "Clearly, Hyundai is an up-and-coming brand," Ibara says. "It has suffered from a reputation of low quality, but that has dramatically improved." Cash incentives are down and leasing is up. Hyundai Motor America CEO John Krafcik says more than 80 percent of the sales are retail. On the dealer side, the captive finance company financed 45 percent of all retail deals through April, up from 10 percent for all of 2008 and 20 percent in 2009. Dealer profit as a percentage of sales rose to 1.4 percent last year from 0.9 percent in 2008. And dealers now like the management team of Zuchowski and Krafcik. They say the departure of Ewanick will not hurt. "The biggest problem was not having a stable management team," says John Staluppi Sr., owner of four Hyundai stores on Long Island, N.Y.
"Now the dealers are confident," he says. "Everybody is making money. The Koreans were unsure if they wanted to give up the reins to the Americans, but with Krafcik and Zuchowski, the organization is going in a great direction." Jared Hardin, owner of Garden Grove Hyundai near Los Angeles, concurs. "Krafcik is totally different" from Zuchowski, he says. "They complement each other. Krafcik is not a salesman but a product guy. "Dave can sell ice to the Eskimos." But Zuchowski's biggest sales job lies ahead: Selling Hyundai as a top-tier brand to American consumers.